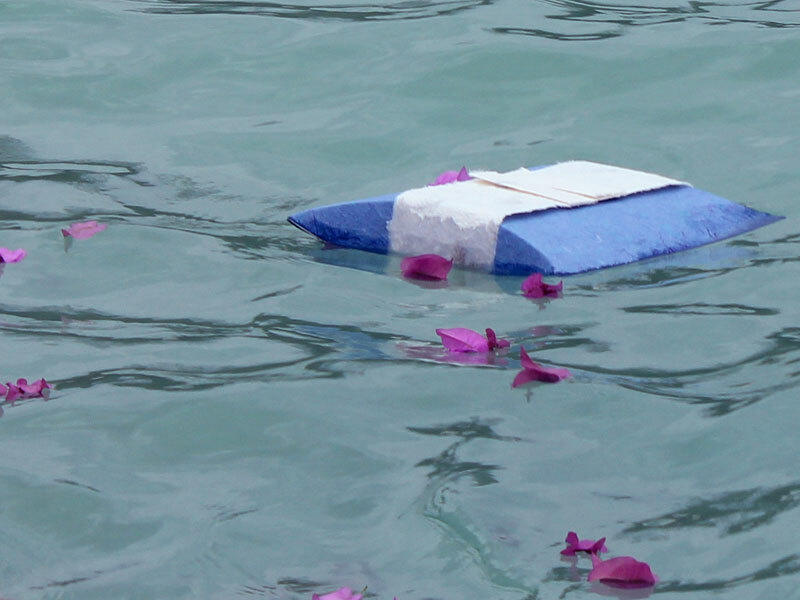 Scattering ashes at sea is a fitting tribute and farewell to a loved one. Most of us have seen heard of pouring ashes into the water from a boat. But you might be unsure about how to organise something like this, or whether you need permission. Our experts have put together this guide to help you through the process. We will explain some of the different ceremonies and services you might consider. After we’ll cover rules and regulations, prayers, poems, and various methods and ideas for scattering the ashes. There are other factors to consider in addition to the actual scattering. For instance, will you have a memorial ceremony? In most cases, there is no particular rules for the ceremony. It is arranged and performed to the wishes of the deceased or their family members. You may prefer a cremation ceremony to be performed according to the religious beliefs of the deceased. For instance, Christian scatterings are often similar to a traditional one on land. They sometimes include a minister who oversees the event with eulogies, prayers, or a scripture. Then again, you could have the ceremony with only family and friends. Otherwise, you might consider a ceremony that is planned around the heritage of the deceased. Or if they were fun loving, it could be a celebration of their love for life with music and even dancing. We will look at some of the possibilities in more detail later. Many people simply pour the ashes from an urn into the water. There is no specific type of urn required for that. Some simply use the temporary container, which the funeral home or crematorium provided. However when scattering at sea, it’s wise to ensure that you determine the direction of the wind, otherwise the consequences can be messy. If you wish to release the whole urn into the water, a biodegradable urn is your best choice. These are created to break down quickly in water are now available in all shapes and designs. These beautiful urns come in quite a few designs including flowers, seashells, turtles, and more. 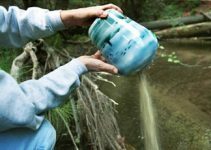 If you’re interested in scattering, we recommend you read our biodegradable urns for water guide which provides some valuable tips before buying. The options are endless. Below we will look at a few ideas and suggestions. Hopefully, one will be right for you or possibly trigger an idea of your own. In many situations, although scattering at sea is desired, the family is unable to attend. This may be due to illness or perhaps the place where the deceased desired is a great distance away. For those circumstances, after the cremation has taken place, you would send the ashes to the company that will be performing the service. The captain of the ship will take your loved one’s ashes along on the voyage and perform a distinguished scattering for you. In most cases, they welcome any requests you may have such as a particular prayer to say, a poem to recite, or music to play. 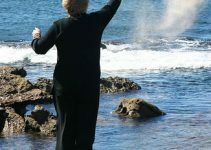 You have the choice to arrange the service yourself or hire a sea burial company to do it for you. Some companies offer specific services such as a mariner’s farewell ceremony. As the ashes are scattered, the mariner’s farewell verse is read as the ship’s bell tolls eight times. 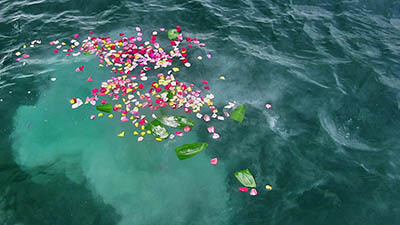 The mourners may each toss a flower into the water as a final farewell. You may arrange the services yourself with family and friends. You could encourage them to express their own experiences and relationships that they had with the departed. Perhaps a story or memory of the loved one that they hold in their hearts. Many times, people wish to release doves as the ashes are scattered. Or flowers are tossed in the water, which trail behind the boat as it circles the area. Then again, it could be arranged around their heritage. Is your loved one Scottish? Then kilts and bagpipes would be in order. A Hawaiian ceremony should definitely include hula music and leis. Consider a religious ceremony, for instance a Buddhist service might include several monks donning their colorful robes. In a typical Buddhist service, they chant during passage to the site and pray over the ashes as they are scattered. If it is a Catholic cremation, please note that the Vatican recently spoke out against the spreading of ashes. Catholics approve of the interment of ashes. Frequently the service is planned around something the departed loved to do. For example, if they loved to fish, you could combine the service with a day of deep sea fishing. Perhaps your loved one was high energy and full of life, then what would be better than honoring them with a brilliant display of fireworks over the water at night. The ashes can be placed in the fireworks and literally become part of the light show. If preserving the environment is important to you, this is an amazing choice. Reefs are created similar in appearance and shape to the real thing. The ashes are actually contained within the reef. Divers lower it to the ocean floor to become a permanent home for sea life. 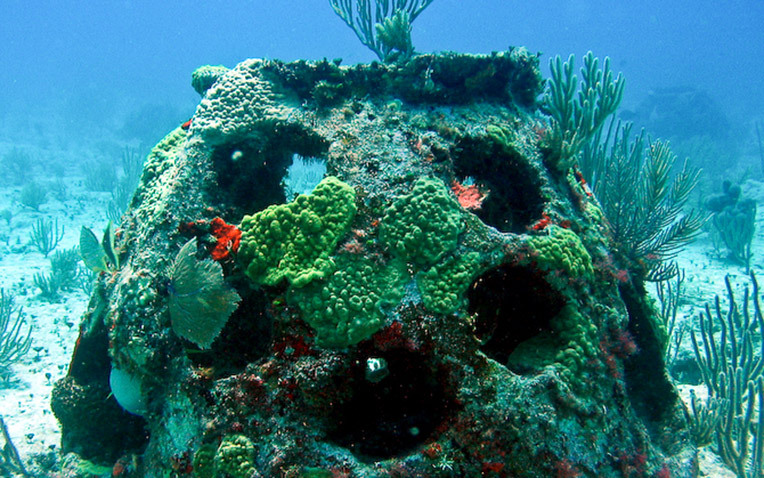 There’s a possibility it could replace damaged or destroyed coral reefs. What a wonderful thing to think that your loved one is helping to save our earth, even after their death. If you decide to scatter the ashes at sea, you don’t have to use all the cremains. If you scatter them all, that’s the end of it. There’s so many things you can do, so why limit yourself to one idea. 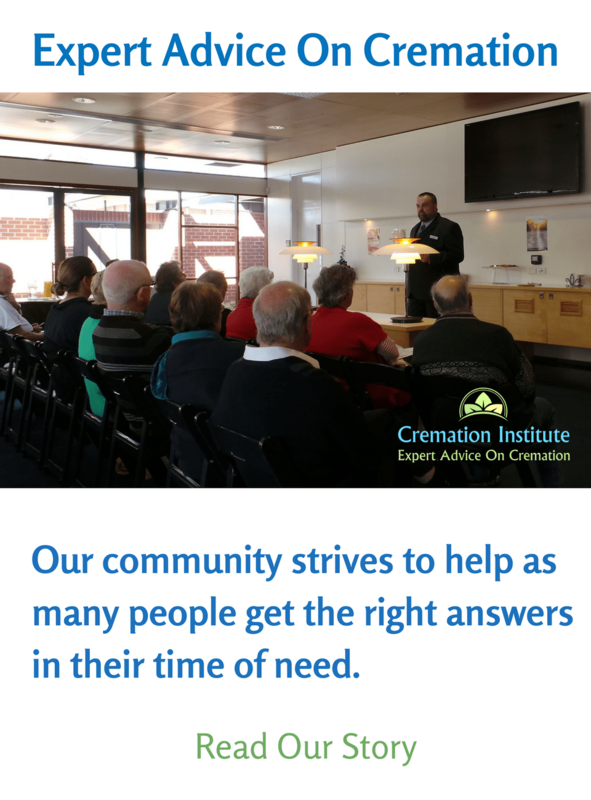 If you looking for ideas of what to do with cremains, we’ve created a number of expert guides to help you. First off, take a look at our scattering ashes guide. If you’re the creative type, our cremation art guide might interest you. Looking for something elegant? 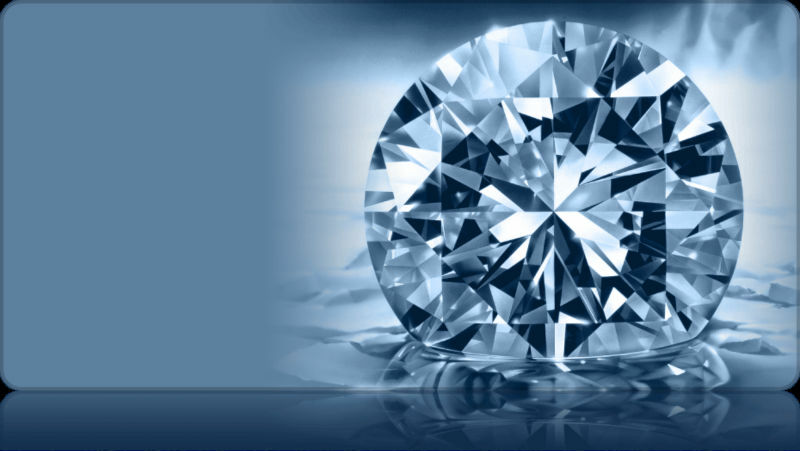 Did you know that cremation diamonds can be made from ashes? There are a number of poems and quotes related to the sea that are appropriate for a scattering service. Below are some you might consider. And the flung spray and the blown spume and the sea-gulls crying. The stillness of calm waves will gently drift by, I will be as one with the sea. remember me as I will always remember you. Trenching is a method of scattering ashes at the beach. Primarily, a shallow trench is dug in the sand with any design you wish. It could be the name of the deceased, a heart, a circle, or anything else. The ashes are then poured into the trench and lightly covered by sand. Friends and family sometimes form a circle around the ashes and have a ceremony of their choice. The trench should be in a location where the water will gradually wash the ashes into the sea as the tide comes in. 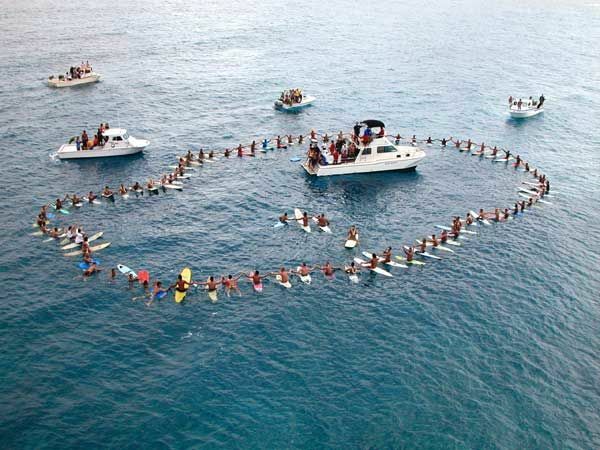 Another idea is for the mourners to form a circle in the water on surf boards, or for non-surfers, small boats or canoes. The ashes are then poured from a boat in the center. This is beautiful when performed just at dusk, with lit candles on all the boats. Sea Scattering Regulations: Do You Need Permission? 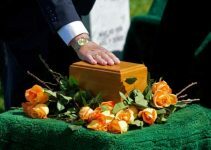 The regulations for cremated remains are not as strict as those for sea burials (Non-cremated remains). They can be scattered at any depth as long as it’s three or more nautical miles from land. Items such as flowers or containers for the ashes are allowed as long as they are constructed from biodegradable materials. In addition, you are required to contact the United States Environmental Protection Agency (EPA) within 30 days of scattering. More information and facts can be found at the EPA Website, such as the needed forms and addresses for your state. However many people do not worry about the regulations, and scatter in the location that they or the deceased desired. Although we’re not condoning it, it’s doubtful that patrols are out seeking people scattering ashes in the wrong places. Of course, that is to your own discretion. However, we definitely urge you to use biodegradable urns and flowers. 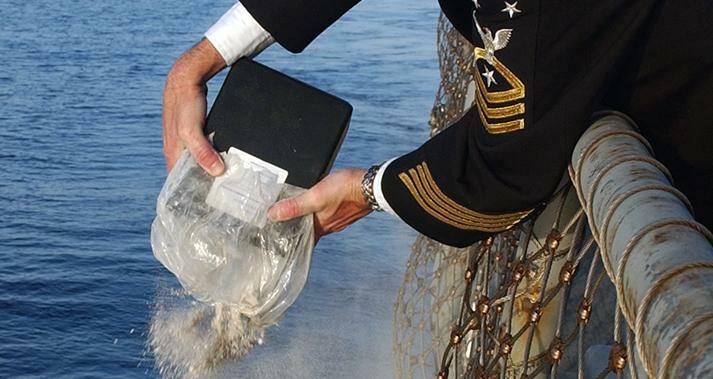 Is Scattering Ashes at Sea right for you? Hopefully, these ideas will help you decide upon a ceremony and the type of service that will honor your loved one. The urns and methods of scattering here only scratch the surface of the available possibilities. Tell us about your ideas and what you did for your loved one.